Even Martha Stewart has been plant shopping in Kingston. In fact, she was a semi-regular visitor in Heronswood's glory days, before it broke our hearts with its 2006 move to the east coast. There's no doubt Heronswood put Kingston on the horticultural map – with or without the help of Martha, who thought she was still on Bainbridge Island. The good news is that the area surrounding the missing nursery continues to earn a resounding thumbs-up from gardeners across the region as a prime horticultural hunting-ground. From Kingston and Hansville to Poulsbo and Bainbridge Island, the northern tip of the Kitsap Peninsula is to nurseries what Snohomish is to antiques, Auburn is to outlet malls, and Forks is to suspenders: the aficionado's ultimate destination. Within a seventeen-mile radius of the Kingston ferry dock waits a trove of excellent independent nurseries offering the new, the rare and the really good bargain. You want cactus? They've got cactus. Looking for something tropical? No problem. Tired of water bills that grow faster than the dandelions in your lawn? They'll sell you enough drought tolerant beauties to cover a small, arid nation. North Kitsap is up to its green thumbs in consumer chlorophyll. Deer Meadow Farm. Owner Kelly Hagood propagates all of her own plants, including many varieties of container plants, coleus, dahlia, pelargoniums and cottage garden perennials. Her husband, Chuck, has earned a reputation for creative welded garden art, trellises and decorative plant supports. Poulsbo Lavender Farm. Lavender and a whole lot more. Mike Barnes offers a well-grown, reasonably-priced selection of perennials each week at the market. Victorian Lady Lavender. Owner Sylvia Peterson sells a selection of choice lavender plants, as well as cut lavender and lavender products. Raven Nursery. 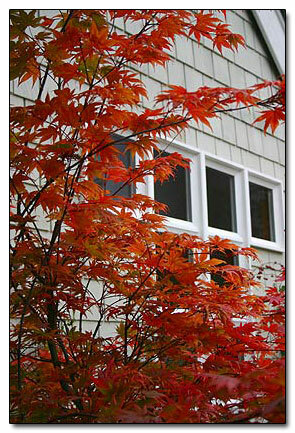 Beatrice Idris specializes in organically-grown daylilies, species maples, native conifers and other Washington natives. Her 300-variety daylily display garden is open by appointment June through August. (360) 598-3323. Labyrinth Hill Farm. Kitsap-grown lavender products available in season at the market and year-round through their website. Susan Harrington, CEO and grower, also consults on the growing and marketing of lavender. Many of these growers frequent other local farmers' markets, including Hansville (Wednesdays, mid-May through September from 3 to 6 p.m. in downtown Hansville), Port Gamble (most Sundays from 11 a.m. to 5 p.m. on Puget Way), Poulsbo (Saturdays from 9 a.m. to 1 p.m. on Iverson and 7th) and Bainbridge Island (Saturdays 9 a.m. to 1 p.m. at City Hall Park). Most markets are open mid-April through mid-October. After the market, it's time to hit those country roads in search of even more leafy treats. A trip to Boonebrier Farm late May through June can be a breathtaking experience with more than 200 varieties of herbaceous and intersectional peonies and 80 varieties of iris in bloom. Owners Jim and Ann Mossman sell potted plants and cut flowers, take orders for fall peony roots (available in September) and schedule appointments for tours. The nursery is open Friday through Sunday mid-May, through late June, 10 a.m. to 5 p.m. (360) 297-7431. A turn north onto Hansville Road leads past 288th Street, the site of the former Heronswood Nursery. Stay on Hansville Road and watch for Delaney on the right and you'll find wholesale grower, Foxglove Greenhouses. Foxglove opens to the public on Saturdays, spring through fall, from 9 a.m. to 4 p.m., and other days by appointment. Foxglove Greenhouses are a major wholesale supplier to such mail-order heavy-hitters as Wayside, Park Seed, and Smith & Hawkins. Owner David Halsaver grows a wide selection of unusual annuals, tropicals, tomatoes, container plants (more than 3 dozen varieties) and both hard-to-find and main-stay perennials. 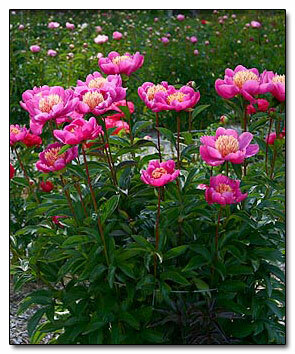 The prices are as attractive as the plants: $5.50 for most gallons and $2.75 for 4" perennials. Plant your containers right on site (bring your own pot or purchase one at the nursery) with expert guidance from co-owner and professional designer, Gail Halsaver. (360) 297-0410. Don't miss Dragonfly Farms, located just three miles farther down Hansville Road. At Dragonfly Farms "abnormality is the normality" and owner Heidi Kaster proves it with huge variety of plants in glorious excess. New this year is a huge selection of hanging baskets, new selections of trees, and annuals including hot-colored coleus varieties. Dragonfly Farms specializes in unusual seed-grown perennials, and agaves, cacti, coneflowers, grasses, bamboos, pitcher plants, shrubs, plus tropical and Mediterranean selections for this zone. While Heidi grows much of her own stock, she recently purchased "a bunch of cool stuff" from the Heronswood Nursery close-out. Her garden art offerings are unique and ever-changing. Her two-acre display garden is open for view to weekend shoppers, as well as to groups for garden tours by appointment. (360) 638-1292. On the way out of Kingston on Highway 104, watch for Savage Plants. Don't worry, the plants don't bite; they're just savage good. This family-run nursery is a feast for the eye with first-rate display gardens and loads of trees, shrubs, grasses, vegetable starts and pottery, as well as specimen trees for instant gratification. Owner Jim Savage, an accomplished landscaper, created an amazing water-feature for the new garden of Heronswood founder Dan Hinkley. (360) 297-8711. Continue down the road to Sundquist Nursery which opens to the public on only a few Fridays and Saturdays during the gardening season (check the website). The display gardens are open on the same dates, or by appointment. Owner Nils Sundquist brings his beautifully grown wares to many prominent shows and sales, including the NW Flower & Garden Show and Bainbridge in Bloom. The nursery offers yummy selections of the newest and choicest (as well as proven favorites) and specializes in epimediums, grasses, shade companions, 50 forms of hardy ferns and much more. You have to appreciate a nursery that promises "plant lust without performance anxiety." (360) 779-6343. A few miles farther down Hwy 307 brings us to Valley Nursery in Poulsbo. Grab a wagon and fill ‘er up with dwarf and unusual conifers, roses for northwest gardens, rhodies, and pretty much anything else your garden demands. The six-acre nursery also has a complete water garden section and a wide selection of tools, soil amendments and supplies. Certified professional horticulturists are always on staff to answer gardening questions. NW gardening personalities Cisco Morris and Scott Connor have both broadcast their radio shows from Valley. (360) 779-3806. 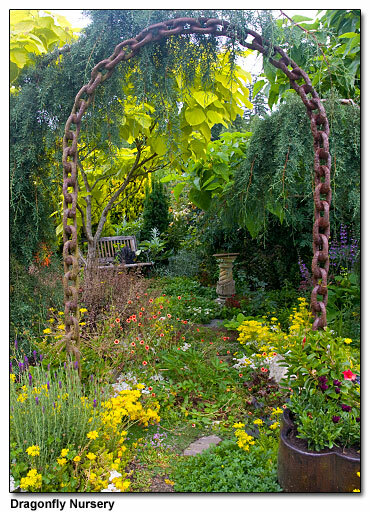 Bainbridge Island holds a great nursery, located on Miller Road, Bainbridge Gardens, a full-service nursery dedicated to quality, selection and the promotion of Earth-friendly gardening practices. An on-site café and espresso bar fortifies customers to explore seven acres of unusual trees, shrubs and perennials, bonsai, garden statuary, pottery and patio furniture. Owner Junkoh Harui has been in the nursery business for more than 40 years on the island, where his family has lived and gardened for a hundred years. (206) 842-5888. Really…what could be more delightful than a day in country where the eagles soar and friendly nursery-folk are eager to fill your trunk with chlorophyll-laden treasures? Even in the wake of Heronswood's demise, North Kitsap has something to make every gardener's heart beat a little faster. Why let Martha have all the fun?